The Twenty-First Judicial District Commission on Judicial Performance, by a vote of ten members, unanimously recommends that Judge Bruce R. Raaum BE RETAINED. 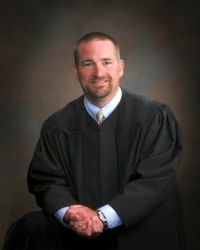 Judge Raaum was appointed as Mesa County Court Judge in January of 2007. He received his undergraduate degree from North Dakota State University in 1989 and his law degree from the University of Nebraska College of Law in 1992. Prior to his appointment, Judge Raaum was an attorney with the firm of Beckner, Achziger, McInnis, Raaum and Shaver. He served as a bond magistrate for the Twenty-First Judicial District from 2004–2008. Judge Raaum promotes the justice system in the community by speaking with school classes that come to the courtroom to observe and by speaking at local schools. The Commission reviewed written evaluations of Judge Raaum from attorneys and non-attorneys. Attorneys surveyed included Prosecution and Defense Counsel. An insufficient number of attorneys involved in civil litigation responded to survey requests to obtain significant results. Non-attorneys included jurors, litigants, court personnel, and others familiar with Judge Raaum's courtroom. The Commission also reviewed a written self-evaluation completed by Judge Raaum and copies of written opinions by Judge Raaum. Commission members observed Judge Raaum in the courtroom and conducted a personal interview of Judge Raaum. Of the attorneys, 71% recommended that Judge Rauum be retained, 10% recommended that he not be retained, and 19% made no recommendation regarding retention. Of the non-attorneys, 93% recommended that Judge Raaum be retained, 5% recommended that he not be retained, and 2% made no recommendation regarding retention. His demeanor and diligence was particularly appreciated by non-attorneys, who indicated that Judge Raaum treats all litigants with respect and uses courtroom time efficiently. The Commission found Judge Raaum to be a hard-working and conscientious Judge who cares deeply about making his Courtroom fair to all participants. The Commission considers him an asset to the bench.